After the bouquet’s been tossed, there’s no reason to leave. Now that all your plans have gone off without a hitch, your honeymoon can begin right here. Champagne and chocolates are just a taste of the special treatment you’ll receive with romantic getaway packages offered by Virginia Beach’s hotels. Celebrate your first ocean sunrise of your married life, and get ready to explore the area’s inland waterways by kayak. Or spend some serious relaxation time poolside or surfside. Head down to Sandbridge Beach and take a surfing lesson together. After long walks on the beach, you’ll want to sample our unique coastal cuisine. Crack crabs dockside, dine on a superb fresh catch or find your favorite pasta - the choices are endless. A dinner cruise promises a memorable evening of sunset views. 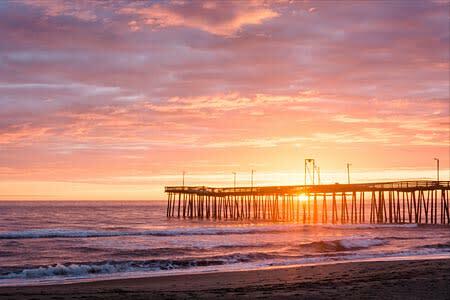 With the big event behind you, it just makes sense to take advantage of what Virginia Beach has to offer.